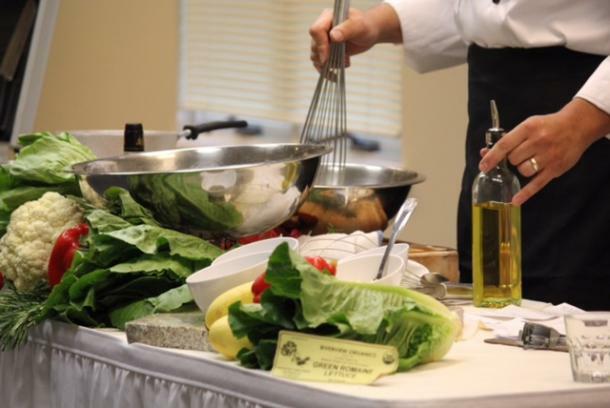 Homestead Village is committed to wellness in many ways with the most important aspect being a commitment to providing excellence in quality and service of our dining program. Many residents and prospective residents are passionate about their health and are pleased to learn that Homestead Village offers a wide selection of healthy options. All residents participate in a flexible dining program and special dietary needs are carefully accommodated. This includes, but is not limited to, Vegetarian and gluten free meals. A committee of resident vegetarians meets regularly with the executive chef to help plan upcoming menus. We also recently added the nutritional information to our daily menus and dinner menus displaying the carbohydrates, fat, sodium, calories, and sugar in each meal. The approximate numbers will include any sides planned to accompany the entree listed. Our Dining Services team also strives to purchase much of their produce from local farmers and suppliers. In a recent Lunch and Learn event, our Executive Chef educated guests about the health benefits as well as positive economic and environmental impact of “buying local.” Following the talk, a representative from Lancaster Farm Fresh Cooperative, also gave a brief presentation about the new co-op facility that was recently built adjacent to Homestead Village’s Farmstead neighborhood. Our menus – which regularly feature fresh, local, seasonal produce – aim to provide the highest-quality dining of any senior living community in Pennsylvania. Did you know, residents can also host events in their own homes or in the new Bachman Center and leave the serving, cooking, and cleanup to our Dining Services team? We also deliver meals, and allow residents to use their dining dollars for their guests. There’s many ways to enjoy the dining program at Homestead Village, but don’t take our word for it – come try for yourself!